I'm not selling shares of myself for the EPT any longer. Jorj95 (30%) and Daee (5%) bought a total of 35%, thank you a lot guys, will do my best and hope to run good! This Sunday I won't have my tournament, because I will be out for the EPT. The hyper-turbos have been good for me and I will keep grinding them. I'm currently at 300K Vpps, which is acceptable, but not good. I'm looking to sell shares of myself for the EPT Monte Carlo Main Event. I am selling pieces at even money in chunks of €106 / $145 and I am looking to sell up to 70% of my action. I will play the event regardless of how much I sell though. If you are interested, ship the money to acoimbra on PokerStars and I will list everyone that buys action on my blogs posts until I stop selling. Congratulations to marcof3 for winning last weeks tournament! Next Sunday the blog tournament will start 1h after the Sunday Warmup, will have a $3.3 Buy-in and there will be a special prize for the final table. Everyone that makes the final table will be credited by PokerStars with a Sunday 1/4 Million ticket during the following week. Have been doing well at the hyper-turbos left, played 1530 two days ago and was interesting, but tiring! I've been studying them more and more and I will probably give a try to the $220s next week. Special $3.3 tournament for readers! Last week I kept the pace on my hyper-turbos grinding and the results were good. This year played 11887 $87.72/$88 tournaments so far and I'm up $7955. Also played 571 $216.24/$220 tournaments so far and I'm down $5752 at these. The numbers might not seem very exciting, but I'm getting a ton of VPPs and FPPs. If at the end of the year I am even on the hyper-turbos I will be extremely happy, as the Supernova Elite benefits are worth 6 digits per year! Currently I have around 205k VPPs and the plan is to have 650 VPPs by the end of June. Will be quite a grind, but I'm very motivated. Didn't have any exciting scores at the big online mtts, but I'm sure that if I keep playing, studying and improving, they will come at some point. Every Sunday I've been hosting an online tournament on PokerStars for my Portuguese blog and has been a big success. 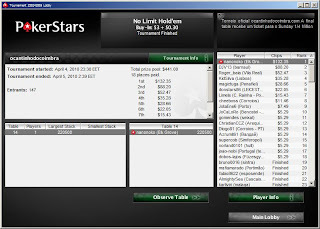 Last week I had 147 players, including some members of Team PokerStars Pro and nanonoko won! Next Sunday the tournament will be open for the readers of my English blog as well. The tournament will start at the same time as the Sunday Million, will have a $3.3 Buy-in and there will be a special prize for the final table. Everyone that makes the final table will be credited by PokerStars with a Sunday 1/4 Million ticket during the following week. See you guys at the tables!